Dr Philip Mc Donald, from Cardiff University came to the Oriel to give a talk on the research work he had been doing on the site of Llyn Cerrig Bach. At the end of the evening, Mr Eryl Rothwell Hughes, a professional historian of the University of Wales, Bangor, approached me and mentioned how my father had stated to him during the inauguration of the plaque in 1972, that it was around the corner from the lake that he had made the discovery. This confirmed to me what I had always thought my father had said to me as a child and suddenly I became very curious as to where this might be. This is an excerpt from the radio interview in 1947, when two local people, Mr John Owen and Mrs E Parry emphasise to the interviewer, Mr Roberts Hughes, that there was no such lake as Llyn Cerrig Bach until the building of the aerodrome. J. OWEN: Ond dyma sydd yn syndod. Efo'r holl sôn am drysor sydd wedi bod yn yr ardal, wyddai neb ddim am y trysor ddaeth i'r golwg wrth godi'r erodrom yn 1943 - trysor Llyn Cerrig Bach fel y'i gelwir. R. HUGHES: Mae o'n beth rhyfedd. 'Doedd 'na ddim traddodiad o gwbwl yn yr ardal ynglyn â hwnnw. J. OWEN: Nag oedd yr un gair. 'Doedd neb wedi meddwl am amser cyn Madam Wen. R. HUGHES: Chlywais i 'rioed mo'r enw Llyn Cerrig Bach ar y lle o'r blaen chwaith. Llyn Traffwll, Llyn Penrhyn a Llyn Dinam. Dyna'r tri llyn - chlywais i 'rioed am lyn arall. Glywsoch chi Mrs Parry? J. OWEN: Cors sydd yno, nid llyn a deud y gwir. Cors Cae Ifan a Chors yr Ynys fydda ni'n galw'r lle. MRS PARRY: A ninna hefyd. Cae Ifan a'r Ynys oedd y ddau dy agosa aton ni. R. HUGHES: Ond mae Llyn Cerrig bach yn eitha enw, o ble bynnag y daeth o.
J. OWEN: Ydi mae o.
also, my father always refers to dredging the bog throughout the interview and not a lake. The lake must therefore have developed whilst dredging. All this has triggered my enthusiasm into starting research into trying to locate this original bog by interviewing local people. I first started with Mr Evan Hughes' children. They confirmed to me that their father was the chief donator of the artefacts due to the fact that he owned the land. They lived at Cae Ifan at the time, but had to move out for their safety as it was now too near the runways since their extension. Being children like myself at the time, they remembered very little of the facts. They did remember some city gentlemen coming and buying a car boot load of items away! Where might they be I wonder? Craig y Carnau (Rock of the Hooves) is now on MOD property and referred to as TACAN Hill by the personnel (Tactical Air Navigation). I visited the present PRO Flt Lt John Phillips who was most helpful and took me to the top of the hill to view the area. This is where it is thought that the Celtic ritual offerings would have been thrown from. After all, Anglesey was the centre of the Druid religion and probably pilgrims travelled from all parts of the mainland to this sacred lake. The ancient Celts worshipped the simple elements of nature, especially water. I then visited the lady at Carnau farmhouse, next to Cae Ifan. She owns Cae Ifan lakeside and remembers my father calling with them often. I now have permission by Cae Ifan and Carnau owners to visit their land anytime. Also, Flt Lt John Phillips fully supports my efforts in locating the site, stating "All it takes is funding for a dig and MOD approval for it to take place". Especially helpful towards me are both Alun Gruffydd, Curator of Oriel Môn and Mark Lodwick, Curator at the Museum of Wales, Cardiff. I am so pleased that through them, artefacts are now coming up to Anglesey for display and future arrangements are being organised for more to come up when the galleries at Cardiff Museum are being renovated. Thankfully, through chance, I have been able to donate three of the artefacts to Oriel Ynys Môn for its duration. My father, wanting a few things staying locally, had given these to the Wigwam Museum at Rhosneigr. When the lady who ran the museum died, about 30 years ago, the items were returned to him and then passed to me. As I further my research I will add any items of interest to this site in due course. 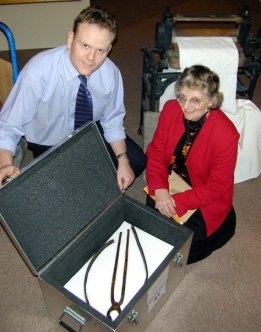 Last February, Mr Alun Gruffydd, Curator of Oriel Ynys Môn arranged an exhibition entitled "A Thousand Things" and he was able to get some of these artefacts back on loan to Anglesey for two months. He invited me there to see them arriving - it was quite amazing for me to see them returning encassed in polystyrene moulding inside heaving airtight metal chests! 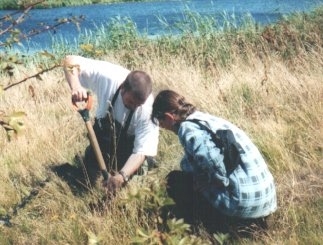 During August, 2000, I arranged a visit to the site of Llyn Cerrig Bach and Cae Ifan area. Two metal detector friends of mine from Cheshire joined me on site, namely Allan Davies and Lance Bennett. Also assisting were Alan Jones, my daughter Gwawr and Shula Ceri, my grandaughter. We carried out a two-hour study of the surface ground first, before finally deciding that we would concentrate on the bank of Llyn Cerrig Bach to the left of the entrance where the plaque lies. We came upon large parts of the dredger that my father and his gang used at the time of the discovery. Also a large area of cinders which had been deposited from the steam engine. I have since relistened to a tape recording which my father made in early 1960. In this he clearly states that it was while they were dredging this area that the wire rope broke and he noticed an old chain lying nearby. This he hooked on to the tractor to drag the lorry and that it continued being used for this purpose all day without breaking. It was only later that it was examined and found to be about two thousand years old!. Hopefully, at a future date, I shall be able to organise another search in this area.